I'm trying to figure out how to phrase this without putting anyone into a corner. Once again we have a situation where ACCRC does not fit within the standard profile inherent in the system. The DTSC is aware of the problems presented in the violation notice and is working with us to find a viable solution. It appears that all parties agree that the destruction of usable/historic material is not in the public's best interest and the system should adapt. This is a two party process and the ACCRC will have to make some adjustments. Just because its cool/old doesn't mean it is not a potential problem and the same handling proceedures for dealing with the material we dispose of would apply to the handling and storage of this material. As such some of our volunteers will need more rigorous training if they wish to work on material without a qualified staff member present (also reasonable and I submit already in place). We also need to demonstrate that we have a method for disposal of material even when we have given up on it. It appears that our methods for disposal of non-recoverable material will suffice. So in a nutshell it has gone from what we perceived as a "do this or else" to a mutual understanding and attempt to find a workable solution. We very much appreciate this position on the part of the DTSC and thank them for demonstrating a refreshing level of flexibility in this matter. We fully expect to work this out in time. First WOW!! thank you all for your support and assistance. Meeting with a higher level rep from the dtsc on the 25th. In addition I have reason to believe that what we call diversion paperwork (diverted from the waste stream) exceeds what they require as "inventory". We track weights and dates on all material going into and out our of re-use departments. and can demonstrate a past history of doing so going back years. The dtsc agent did not bother to ask what sort of tracking system we might actually have before running off with a false assumption and slamming us with a class 1 violation. If my assumptions are correct than all we have left is the "speculative acumilation" nightmare. In general this is to keep people from taking waste, collecting it into big poisonous piles and then walking off leaving the public to deal with the problem. More specific example. When sb-20/50 came into play there was a legitimate concern about people collecting material with the expectation that the state would eventually pay for its destruction. This was a legitimate problem and as many vendors have huge material streams and if allowed to stockpile and then bill the state, would have bankrupted the new system. I have no problem with either of the above examples. How this is misapplied in this case. In the second example above, We are actually taking material out of the state payment system and as such saving the state money so I cannot determine how this determination is in the states best interest. So no clean up and no state payments on this material. Whats the problem? In fact since our various re-use projects are things that we fit in around paying the bills I cannot recall a single project that did not take at least a year. For example the beowulf cluster development is at least 10 years old. The electric vehicle project (dead van,dead electric forklift,a ups as the charging system, a buttload of ups batteries,motor controllers from old industrial milling equipment,) is over two years old and expected to roll sometime next year. In additiion our hydrogen vehicle program (we are quite probably the only people on earth who have gotten a 1969 lincoln continental to run on hydrogen) requires huge amounts of metal hydride as a fuel storage medium. We have two options to aquire this. buy it (very expensive) or recover it from metal hydride batteries. Based on current flow will take another year before we have enough storage to be comparable to a standard gas tank. So a 460cid internal combustion engine thats cleaner than a prius (The exhaust is water) and all the information on how we did it provided to the public for free is not in the publics best interest? And if we fail the information is still valuable and the failure would be disposed of in the proper manner so again why do we need to abandon this project after a year? So is free commodity supercomputing and completely repurposed zero emission vehicles something that the dtsc wants to discourage? How does the state profit from this? Do I throw them away? I was woken up by a call from the dtsc today. During the course of the conversation I expressed my concerns and thought that we were actually getting somewhere. When the call did not come in I called the dtsc back and was informed that the conference had been cancelled due to offensive statements on this blog and that this had come down from "the executive" office. Not calling to tell someone that you had cancelled the conference is a cowardly and creepy act. Using unpleasant opinions as an excuse to avoid a problem is also a cowardly act. For the record I stand behind the personal opinions expressed in this blog and will continue to express them. Apparently the dtsc is unaware that the internet in general and blogs in particular tend to have rather rough opinions. So instead I have been told that I can try to get an extension but I have no assurances or expectation of actually getting one. otherwise we are in violation and subject to fines as of the 17th of this month as the minimum fine is more than our total assets we may close as early as monday. I was told that I really should give some action points for those who want to help. unfortunately I'm not all that used to asking for or accepting help so this may seem a little disjointed. I'm also not all that well educated so this may not come across as intended. I'm also very,very pissed off. I submit that she's clueless and probably offended by language so be polite and use simple concepts and single syllable words. Contact your state and federal reps and ask them to look int0 this. The penalty for this violation is not less than 2000 dollars and not more than 25000. As of this morning accrc's total assets equal less than $500 dollars so whatever the fine is we are screwed. In addition our legal rep is a volunteer and will need to go back to being gainfully employed so if this doesn't blow over soon, so we will need to fund our defense. Up until now we took great pride in being a self funded charity (we earn the money to cover our operations spending what conventional thinkers would call the profits on the charitable placements) and did not ask for cash. But no amount of penny pinching will take on a deranged state agency. If you have ideas,contacts,comments etc. Comments are open and we are very much hoping that others have better ideas than we do. It looks like accrc has finally found an obstacle it cannot overcome. Government stupidity. We have been told by the department of toxic substances control that we will have to inventory all material that we divert and we are not allowed to stockpile any material for more than one year under any circumstances. This would preclude any support for Makefaire,the shipyard,the tech museum,the exploratorium,vintage tech,the computer history museum etc In addition we cannot find any reason for this that would not also apply to the computers we place so we expect to be told by the state that we are in voilation of state law in regards to the distribution of toxic waste in the form of free working computers. Please note that if I destroy this material I have none of these restrictions. So thanks to the state re-use has more hassles,hurdles,and paperwork than destruction. So not only does the system only pay for destruction it now is actually impairing re-use. I have supported the maker/tech community wholeheartedly and have rarely if ever asked for anything in return. Today I am calling in all my markers. I do not know what to do, My only hope at this point is to open source the problem and see if anyone has any ideas or contacts that I can use to get around before she kills us out of a love for rules and a profound disconnect from reality. 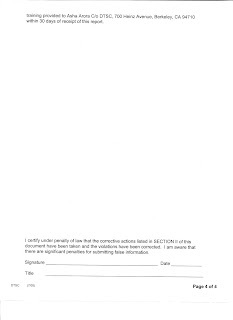 Following is an objection to the Section I violation. 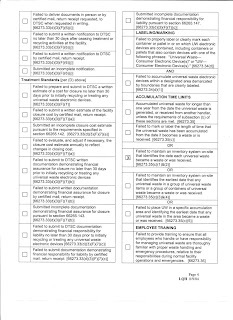 Also enclosed are several documents supporting our corrective action on Section II violations as required by the Summary of Violations for the inspection of our facility on 8/15/07. 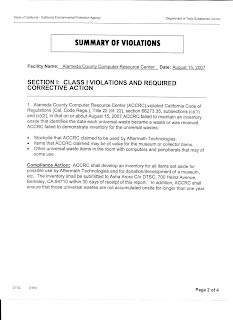 a.Stockpile that ACCRC claimed to be used by Aftermath Technologies. b.Items that ACCRC claimed may be of value for the museum or collector items. c.Other universal waste items in the room with computers and peripherals that may be of some use. Compliance Action: ACCRC shall develop an inventory for all items set aside for possible use by Aftermath Technologies and for donation/development of a museum, etc. 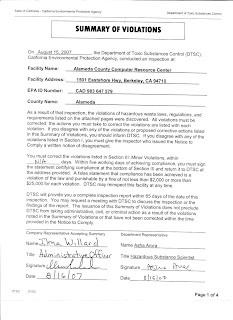 The inventory shall be submitted to Asha Arora C/o DTSC, 700 Heinz Avenue, Berkeley, CA 94710 within 30 days of receipt of this report. In addition, ACCRC shall ensure that those universal wastes are not accumulated onsite for longer than one year. Objection: We dispute the definition of universal waste in this context. a. Repurposable material is not waste. b. Items of historic interest are not waste and disposing of them after one year would be destroying history for a short sighted bureaucratic requirement. c. What does this mean? Please define. As it is not waste, we dispute the requirement to inventory and dispose of non-waste. charitably place. We fear that this interpretation on all our other reuses would eventually be applied to our computer refurbishment and therefore stop all reuse operations. As our primary goal is reuse and this inventory requirement would preclude reuse, is it the DTSC’s intention to close us down? Also, we wonder if this rule is applied to any other organizations that do these functions for charitable purposes, such as Goodwill Industries? If not, why are we being singled out for this inventory issue? Is Goodwill required to get rid of their inventory after one year? The material in question is not waste. In an effort to promote environmental responsibility, ACCRC demonstrates that one does not need to squander resources by buying new materials if more environmentally correct materials are available for reuse. People bring their material to us because we contribute to the protection of our environment by making every effort to reuse any and all material first, before consigning them to the waste stream to be recycled. When items and material are donated to ACCRC, we first direct potential items/materials to either of our reuse departments (Computer Placement or Aftermath Technologies). If we determine at initial donation that the material has no current reuse potential, it is sent on to a recycler. Aftermath Technologies is a project of ACCRC that is devoted to technological reuse. This department supplies material to other organizations for projects ranging from alternative energy to art. Examples include organizations like Make, the Shipyard, Greenpeace, the Crucible, the Exploratorium, many local schools and the Boy Scouts, who draw from Aftermath for various educational, environmental and artistic projects. We also investigate reuse potential. Examples include making super-computers out of reutilized commodity hardware and converting our entire facility to run on waste vegetable oil, propane/methane powered vehicles, etc. All of these projects draw exclusively from what you call the waste stream. By conventional means these accomplishments would have cost tens of thousands of dollars and would be rendered impossible by this requirement. 1.Violation: Failed to provide training to all employees conducting treatment of UWEDs. Compliance Action Completed: Following please find a copy of the training provided to employees who dismantle UWEDs. We have provided UWED training for Phil Fraser and James Burgett. Please see the following signed and dated “UWED Training Acknowledgement” forms and our UWED training module. 2. 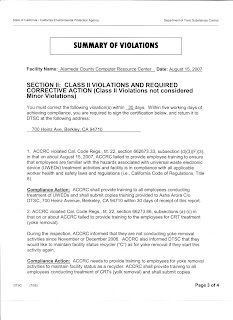 Violation: Failed to provide training to employees for CRT treatment (yoke removal). Compliance Action Completed: We in fact did provide training, to our employees for CRT treatment (yoke removal). On 8/15/2007, I faxed signed copies of our “ACCRC Employee Safety Training Sign-in Sheet” indicating that both Diane Paulson and I (Ilma Willard) received CRT training on November 2nd & 3rd of 2006. On the next day’s followup meeting with Ms Arora, I showed her our ‘ACCRC CRT Training’ module upon her request. Ms Arora then decided that our training module, which had passed two prior inspections, was incomplete. We request that Ms. Arora explain what previous inspectors missed regarding our CRT training module so we can revise it to her specifications. As we consider the Ms. Arora’s interpretations to be fundamentally flawed, we would like to formally request that we converse with a different DTSC inspector regarding these issues.